In the video game “Metal Gear Solid V: The Phantom Pain,” a mercenary named Venom Snake seeks vengeance throughout Soviet-controlled land in Afghanistan and Africa. The arm he lost in action was replaced by a weaponized, bionic red one. This week – thanks to the help of an industrial design student at Philadelphia University – a suburban man born without a left hand will get to call a red version his own. His isn’t designed for combat, though. Rather, this version will allow the man, who recently turned 30, to shed the “inhuman” prosthetic claw that had limited utility – the cheapest version available – for a non-motorized replica from his favorite game. The man with the Snake replica isn’t keen on drawing attention to his identity, but the design student who made it possible – Gordon Jackson, 23, from Manayunk by way of Wayne, Delaware County – proudly showed it off at an interview near campus last Friday. “When he initially came to me, he said, ‘The claw makes other people very uncomfortable.’ They look at it, but they don’t want to say anything,” he said. “And, prosthetics that actually look human often come off as tacky, so some people are uncomfortable with that, as well. The design itself is an affordable option amid expensive alternatives. That’s why Jackson wanted to make it available for anybody else who might be interested in the design technology. He's done that by posting open-source files online. Jackson, who runs Armatus Designs, Philadelphia industrial design firm, garnered substantial attention in late 2014 for his mission to design (and fund) a fully functional “Bat Suit." He’s in the process of building his fifth, and final, model. 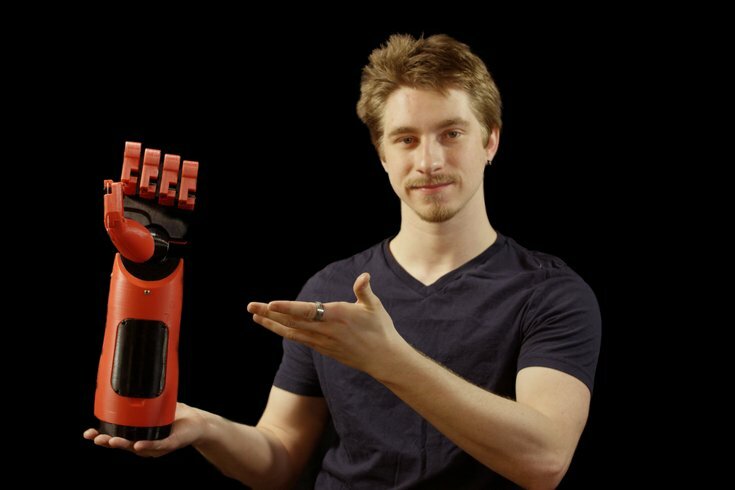 While that project enabled him to build up a substantial Facebook audience/customer base, Jackson told PhillyVoice this commission for a functional 3D-printed prosthetic hand proved substantially more rewarding from a different perspective. He expanded beyond the basics that he shared in a “Phantom Pain Prosthetic” demo video. Jackson learned that most non-motorized prosthetic hands rely on the user to flex what’s left of their wrist to close the fingers. Considering his client had no wrist with which to do that, he went with the concept that the fingers would be closed when it was at rest and then manipulated – via a knob near the bottom of the prosthetic operated by the right hand – to open the fingers and place them around an object. He’s explains the process – from computer-aided draft (CAD) and 3D printing to testing and construction of 45 individual pieces, 14 retention springs (one per finger joint), seven feet of steel wire and screws – in-depth in an additional five-minute 30-second video posted late last week. With budget a major concern – and impetus for the commission in the first place – he found a way to create a prosthetic that requires less than $100 budget for all materials including polyethylene terephthalate, or PETG, plastic. The forearm is not computerized in the least and, thanks to the open-file sharing, Jackson doesn’t face concerns about blowback from the video-game creators. The open-source aspect was particularly appealing on this project because it’s an item that can benefit others. The project has been in the works for roughly six months – from looking at available prosthetic options to sending it out to the client next week – and it took a bit longer because Jackson couldn’t commit to it beyond an on-again, off-again schedule. “The instant appeal was that I’ve never had an opportunity to do a project that benefits more than just the initial client,” he said over lunch. “Right up front, we knew that this was going to be 3D printed because it’s so complex, I wouldn’t want to make the parts by hand. While it’s not 100 percent true to the Metal Gear robotic arm – in the game, knuckles operate independently of the fingers, but there was “too much friction in the system” to replicate it via 3D printing – the creator noted the client was fine with sacrificing that function. Sure, he conceded that not everybody might catch on to the inspiration for the arm when they see his client sporting it, but many will. “The geek-culture crowd will recognize this and say not only is it from that game, but it actually works,” he said. “It’s making this concept that people loved into a real-life thing.